You Can Find Heraldry Everywhere! So, we’ve talked about, and shown you, the real heraldry, “funky” heraldry, and even some made-up “heraldry” that can be found in High Point, North Carolina. But now we come to what I call the “non-heraldry” portion of this trip. By that I mean, the places where heraldry or a coat of arms would be an ideal display, but where instead we find simply a blank cartouche (or cartouches). 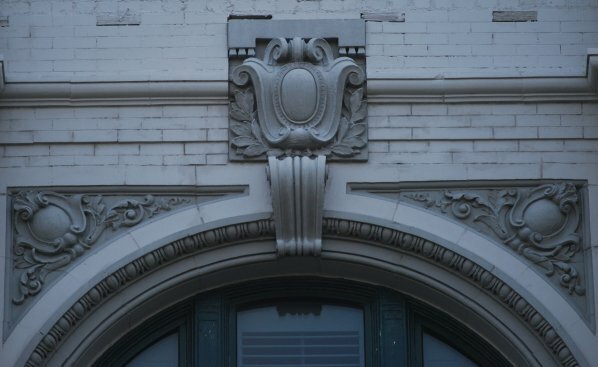 This first cartouche is on the pediment of the First United Methodist Church on Main Street. And here, on the facade of another building, are not one, not two, but three empty cartouches in an otherwise really cool display of architectural decoration. These empty places where heraldry could live just about drive me nuts sometimes. With a little more thought and effort, some really good armory could be placed there. It’s almost enough to make me want to go back with a ladder and some paint. But, no, I’ll be good. For some reason, some folks think painting on a building you don’t own is vandalism, even if what you’re trying to do is show folks that heraldry can be an important part of the architectural embellishment of a building. Maybe another time. Many of the buildings at Yale (and other colleges) are built in the Gothic style, and have little niches here and there that in a real Gothic building would have a statue of a saint or a king or something in it. Most of these niches are empty, which makes them look extremely odd.